Aloha Amigos! We are Tenerife Surf Camp (TSC) – a surfing school in Tenerife. We are in no rush but absolutely focused when it comes to anything that is in any way connected with surfing. We organise active holidays in Tenerife – youth camps, individual training courses and team building retreats for companies (Incentive). Our main goal is to promote surfing holidays as a way of active recreation. With us you can explore the secrets of this wonderful sport, learn the surfers lifestyle, polish your skills or start the adventure of surfing from scratch (group surfing camps, intimate surf trips). We have all you need – complete, top-quality equipment, tailored to the requirements and skills of each student. For those who know surfing, we offer surf equipment rentals. Surfing in Tenerife rulez – contact us and book your surf holidays! Individual surfing course in Tenerife. It’s the perfect way to quickly move forward from the necessary basics to free “flying on the waves”. Start your surfing adventure today! Our instructors will unveil step by step the secrets of this amazing sport for you. Surfing courses in Tenerife conducted individually or in small groups, will let you acquire basic reflexes in the water and techniques of the sport teaching you to understand and “read” the waves in a quick and effective way. All classes are conducted under the supervision of experienced teachers who know Tenerife’s surf spots inside out. 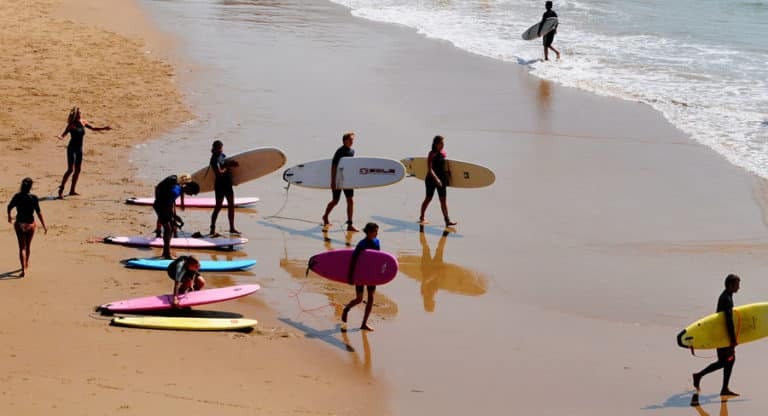 An offer of group holidays for people who want to explore the delights of surfing, improve their skills and learn about secret locations and the beautiful surf spots of Tenerife. We will plan and organise the stay of your group in Tenerife in a surf style. Embark on a group surfing adventure. We will plan and organise your stay in Tenerife in a surf style. We will find an ideal location for you to stay near the ocean, we will organise full board (visits to local bars and restaurants, vegan and vegetarian options) and additional attractions, such as sightseeing tours, catamaran cruises with dolphin watching or paragliding. For fans of skateboarding, we have night tours on surfboards and longboards.